NJ Sprinkler Installation FAQ! Bergen Passaic Lawn Sprinkler Questions Answers! WHAT IS INVOLVED WITH THE INSTALLATION OF A LAWN SPRINKLER SYSYTEM? After we obtain the plumbing and electrical permits and have the utilities marked out the actual installation can begin. The system is designed to provide the most efficient use of available water whether it is supplied from a water meter, a well or other water supply. The system will be divided into Zones that are controlled individually and activated by a SMART irrigation timer featuring weather based CLIMATE CONTROL. Sprinkler heads, electric valves and tubing are installed using a variety of techniques such as manual and machine excavation followed by complete property restoration. The final steps are testing and adjustments followed by timer programming and the setting of the Climate Control System. WAIT A MINUTE-WHAT IS CLIMATE CONTROL? DON'T I GET A RAIN SENSOR? Rain Sensors are 25 year old outdated technology that only reacts to one type of weather-Rain. A Rain Sensor will not adjust your watering program when it gets hotter or cooler. It will not measure solar radiation and temperature or have a reference point for seasonal differences-in short it will only briefly interrupt a fixed watering schedule. A Climate Control System measures and reacts to rainfall, solar radiation and temperature and then compares that data on a daily basis to at least 10 years of stored historical weather data to arrive at how long to water the various zones. With such a system in use your lawn and plantings will receive MORE water when needed due to hot and dry conditions and LESS water when the weather cools down. The benefits to you are smaller water charges (by not wasting water when it is not needed) and a healthier landscape that receives the water it needs when it needs it. This type of Climate Control is called SMART IRRIGATION and even has its own month declared by New Jersey-July. At Raffiani’s Automatic Sprinkler Service we began installing Climate Control in 2011 and the water savings feedback and healthier landscapes our clients enjoy says it all-CLIMATE CONTROL TRUMPS RAIN SENSORS HANDS DOWN! I AM CONCERNED ABOUT DAMAGE TO MY LAWN-WHAT CAN BE DONE? Water your lawn every day for a week prior to the installation. Make sure the lawn is cut within 3 days before work begins. Have all lawn furniture and other items safely stored away. And water your lawn again-water is the key ESPECIALLY WHEN IT IS HOT! We emphasize the watering part because in the summer if the turf is dry it will go into shock when dug up and thus slow the healing process. Most people under water so remember-if you think you have watered enough go back and WATER AGAIN! Yearly maintenance involves the activation, testing, adjusting and programming called SPRING SERVICE and WINTER SERVICE (in the Fall) to protect piping and other components from freeze damage. If your system has a Testable BackFlow device mid-summer testing is also done to ensure proper operation. In our experience sprinkler systems that are regularly maintained deliver many decades of trouble free enjoyment. I HAVE HEARD ABOUT DRIP IRRIGATION-WILL MY SYSTEM HAVE IT ALSO? Drip irrigation is a wonderful way to apply water directly to plant roots but is only used under ideal conditions due to its delicate construction. Hedges and certain plant beds are an excellent use but any area that is regularly disturbed by tilling, ground maintenance crews and constant foot traffic are a recipe for high cost repair call backs. However if your landscape has the right conditions it is an excellent water saver. CAN ANYONE SUCH AS A LANDSCAPER INSTALL MY SYSTEM? If an individual or a company has a VALID IRRIGATION LICENSE AND BUSINESS PERMIT ISSUED BY THE NJ DEPT. of COMMUNITY AFFAIRS DIVISION OF CODES AND STANDARDS then the answer is yes. Since there are many unlicensed, unregistered and uninsured companies and people out there that operate “in the shadows” it is IMPORTANT THAT YOU ASK FOR AN IRRIGATION LICENSE, A BUSINESS PERMIT AND PROOF OF INSURANCE. If a price is too low to be true there is a reason-protect yourself by doing a little DUE DILIGENCE prior to signing any contract. Homeowners can call the NJ DEPT. of COMMUNITY AFFAIRS DIVISION OF CODES AND STANDARDS at 609-292-7898 to confirm current license status and valid business permit of individuals and companies. WHICH MANUFACTURER OF IRRIGATION EQUIPMENT MAKES THE BEST PRODUCT LINE FOR MY PROPERTY? The short answer is: All of them and none of them. The long answer comes from the FIVE DECADES we have been in this business during which time we have noted something that in mathematics is known as a “constant”. We have installed, serviced, repaired and replaced components from almost every manufacturer supplying irrigation equipment to the North East region and have discovered that EVERY MANUFACTURER HAS ONE OR TWO OUTSTANDING PRODUCTS AND THE REST OF THEIR LINE IS SO-SO. For this reason we use the best components from 3 to 4 of the top companies supplying irrigation equipment to our industry. We pick and choose the BEST ROTARY HEAD, the BEST SPRAY HEAD, the BEST VALVE and the BEST CONTROLLERS BASED ON WHICH COMPONENTS WE KNOW FOR A FACT WILL DELIVER TO YOU MANY YEARS OF EFFICIENT AND TROUBLE FREE SERVICE! IS THERE A WARRANTY WITH THE SYSTEM? Yes---5 full years on the entire system, 6 years on the timer and 25 years on the tubing. Our warranty is one of the longest in the industry and in most cases exceeds manufacturer warranties. PRICE IS USUALLY MY MAIN CONCERN WHEN BUYING ANYTHING-SHOULDN’T I JUST GO WITH THE CHEAPEST COST? Price is only one measure by which a spending decision should be made. When purchasing a product online or in a store if you are getting the IDENTICAL product then the decision is easy. When purchasing a lawn sprinkler the cheap price is most always the wrong choice to make. This is because less expensive installations are cheaper for many reasons and if the installation is done poorly it is very expensive to correct later. Your decision should be based on many factors such as (but not limited to) contractor supplied permits, contractor location, years in business, neighborhood references, referrals, Better Business ratings and design expertise. A little Due Diligence will serve you well and leave you satisfied with your purchase. Internet Connected Water Savings and Landscape Lighting Control! Click HERE for Our Helpful Landscaping & Watering TIPS! JULY is New Jersey's official Smart Irrigation month. At Raffiani's, we do it all year long! Click here to go to our COUPONS page and start reducing your water use today! 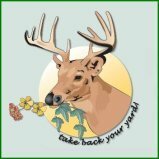 CLICK On The DEER Images!